I keep hearing things about Japan and how it was here first to begin with and stuff…what happened? This is a bit long, but let’s go back to 2002. Duffy, known then as “The Disney Bear”, was made to help advertise the opening of their new store in Downtown Disney: “Once Upon a Toy”. He was on a few shelves, but they weren’t very visible and there wasn’t much, if any, publicity. Duffy also had a different story: Mickey had gotten to the park early and was lonely, so he brought his favorite teddy bear with him. Tinkerbell saw him and with some pixie dust, brought the bear to life, an imprint of Mickey’s head appearing on the bear’s face. Due to not doing well, the bears slowly faded out, however, Tokyo Disney picked it up. While he didn’t receive a name and full story for a year (2005), he was still incredibly popular there. In 2005, he was named Duffy and given a new story: Mickey was going to travel in his boat and as a present to wish him a safe trip, Minnie made Mickey, Duffy. The two would take pictures together and send them to Minnie until they returned home. Duffy was an instant hit and various limited outfits come out every few months in Tokyo Disney. In the fall of 2010, Duffy returned to the US with the story and name he received in Japan. While it was a bit of a slow start, his popularity is growing and new outfits are appearing in the US for Duffy to wear. The Kidcot Fun Spot Activity was even changed to Duffy (as were the stamps) and Duffy has meet and greets in Epcot. You can find Duffy all over Epcot and in at least a few shops throughout each park. I have this bear that looks just like Duffy, but it’s called a Disney Bear/doesn’t have the same tags! This kind of sounds like a Build a Bear rip off…I mean, a bear you can dress-up? Honestly, what made Build-a-Bear original is because you could get your bear stuffed right at the store. Buying clothes and dressing a plushie or a doll up isn’t new. Look at Barbies and American Girl Dolls–both had outfits you could buy for your doll. While plushies weren’t as mainstream for this department, it DID exist, so Build a Bear isn’t actually original in that concept. And considering they don’t even make just bears… As mentioned in question #1 though, Duffy wasn’t -made- to be dressed up. There are plenty of people who don’t dress their Duffy at all or even just keep it in one outfit. 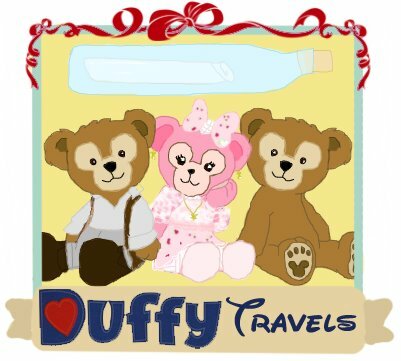 Duffy is essentially a traveling companion and is supposed to bring good luck and happiness on your travels! The clothes are just a fun bonus and some are really beautiful. Shellie May is Duffy’s friend (And I suppose you could say girl friend, though, I don’t believe it’s official). Minnie made her when Duffy got lonely and wanted to have a friend like him. She came out in 2010, but did not receive a story until 2011. I keep seeing other color Duffy! Where are they? They are the old US Disney Bears. They are retired and you’ll have to buy them from someone who has one. I saw these cute little Duffy in a glass box in various colors…What about those? Those are Limited Edition for celebrating the New Year in Tokyo Disney. Each color is for a different year. What’s with that bear that looks kind of like a Duffy version of Minnie? Or those UniBEARsity Bears? While also teddy bears, they are not part of the Duffy family. The Minnie-esque bear is part of the Minnie Couture series. What outfit is your Duffy bear, Ahim, wearing?/Did you make the outfit that your Duffy bear, Ahim, is wearing? I can’t afford/don’t like any of the outfits for Duffy, where can I find other clothes for my Duffy? Well, if you just mean the clothes for one of the places you can/can’t visit, you could try looking on Ebay for clothes from the other parks. If you mean all of them, Build a Bear clothes fit Duffy very nicely and you can always try looking on Yahoo! Japan and Ebay for custom made outfits for Duffy and Build a Bears. You can find other kind of outfits that fit Duffy using this tag. Are there any other official Disney clothes that work? UniBEARsity clothes fit fairly nicely (pants will be a bit short/tight, but besides that), but are a Tokyo Disney only product and would be hard to get. Exactly what are custom outfits? Custom outfits are outfits that usually fans of Duffy or people who know fans of Duffy make themselves. Usually they will be OOAK (One of a Kind), but sometimes, a person will make a few (usually no more than 10-20, unless just shirts/pants/shoes and not full outfit sets). They are usually sold on either forums that specialize in selling all kinds of things for that doll/plushie, Ebay, Etsy, or Yahoo!Japan. You can sometimes find them on a person’s own personal site if they have a domain or their outfits/articles of clothing are popular enough. Do you directly endorse/recommend any of the custom Duffy you show?/Why are Custom Duffy posted here? Unless I actually say so, no, I do not. The reason they are posted here is because we consider it something relatively new and unique (when it comes to Duffy in particular) and because this blog is for -everything- Duffy, from our own pictures, to pictures people want us to post up, to custom Duffy, to Duffy news. Everything Duffy will be here. Your pictures are kind of small…is there any way I can see bigger versions? What’s the difference between Duffy and Shellie May? What’s the difference between Duffy and the Disney Bear? Why do some Duffy have open mouths? Why is Duffy so expensive? Why was Duffy named Duffy? In the story, Mickey put the bear Minnie gave him in his Duffle Bag. Thus, Duffy. Why is/are the header(s)/icon(s) randomized? Why do you have a donation button?/Why do you need donations? Donations are essentially going to be used for transportation and the purchase of Duffy-related items. While thanks to Time Shares and Annual Passes, actually being and staying in the park isn’t a problem, but getting there is still a bit of an issue for us. I live all the way in NY and while Nomi and Jun live closer, there’s still gas if driving, or the cost of public transportation, and other things that have to go into it as you can’t actually walk to Disney (well, depending on your hotel, you might be able to walk to parts). Similarly, having been to a lot of the other parks, I know how wonderful it is to see them 🙂 And while we can still use the Time Share for hotel stays, the annual pass doesn’t work for parks outside the country, but really, the biggest issue is just the cost of air and gas right now. Anyway, as mentioned, the only other thing besides transportation we will use donations for is Duffy-related items. We can only afford so much and we’d love to be able to get close-up pictures of everything ourselves. Essentially, this could help us do that, as everything adds up after a while. Why do you have stuff from the parks in the US on your wish list? Can’t you get them yourselves? 1. It’s essentially limited and we missed it/couldn’t get it/couldn’t afford it at the time. 2. It was discontinued a long time ago. 3. To keep track until we can go and and get it. 4. Because we only want parts of the outfit and overall, not enough to warrant actually going and getting it. Most of the time, if it’s not #2 with the Disney Bears before Tokyo Disney picked them up, it’ll be #3 and sometimes #4. Why wasn’t my comment accepted? Either because it was spamming/flaming (We don’t mind people who disagree, but flaming is a whole other story) OR by accident. Sometimes, our e-mails don’t send us the alert of a new comment we need to approve–other times, it gets caught in the spam filter. If you don’t see your comment up within 24 hours, feel free to send us an e-mail. Is there any way I can get a Duffy without going to the parks or using Ebay? You can call 1-877-560-6477 or send an email to merchandiseguestservices@disne​y.com.